Background: The amount of resources, particularly prepaid resources, available for health can affect access to health care and health outcomes. Although health spending tends to increase with economic development, tremendous variation exists among health financing systems. Estimates of future spending can be beneficial for policy makers and planners, and can identify financing gaps. In this study, we estimate future gross domestic product (GDP), all-sector government spending, and health spending disaggregated by source, and we compare expected future spending to potential future spending. Methods: We extracted GDP, government spending in 184 countries from 1980-2015, and health spend data from 1995-2014. We used a series of ensemble models to estimate future GDP, all-sector government spending, development assistance for health, and government, out-of-pocket, and prepaid private health spending through 2040. We used frontier analyses to identify patterns exhibited by the countries that dedicate the most funding to health, and used these frontiers to estimate potential health spending for each low-income or middle-income country. All estimates are inflation and purchasing power adjusted. 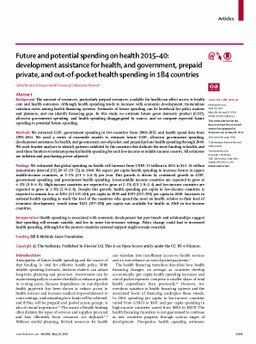 Findings: We estimated that global spending on health will increase from US$9.21 trillion in 2014 to $24.24 trillion (uncertainty interval [UI] 20.47-29.72) in 2040. We expect per capita health spending to increase fastest in upper-middle-income countries, at 5.3% (UI 4.1-6.8) per year. This growth is driven by continued growth in GDP, government spending, and government health spending. Lower-middle income countries are expected to grow at 4.2% (3.8-4.9). High-income countries are expected to grow at 2.1% (UI 1.8-2.4) and low-income countries are expected to grow at 1.8% (1.0-2.8). Despite this growth, health spending per capita in low-income countries is expected to remain low, at $154 (UI 133-181) per capita in 2030 and $195 (157-258) per capita in 2040. Increases in national health spending to reach the level of the countries who spend the most on health, relative to their level of economic development, would mean $321 (157-258) per capita was available for health in 2040 in low-income countries. Interpretation: Health spending is associated with economic development but past trends and relationships suggest that spending will remain variable, and low in some low-resource settings. Policy change could lead to increased health spending, although for the poorest countries external support might remain essential.